Rocketing their way onto the big screen for a colourful, computer-animated escapade are PlayStation favourites Ratchet and Clank. This odd couple first appeared in a 2002 sci-fi platformer and the film remains true to its source material by roughly following the plot of their introductory adventure, enriching the original action by drawing on subsequent franchise developments. Several of the series’ key cast members return too – including those voicing the titular duo, James Arnold Taylor and David Kaye. They’re joined by a host of Hollywood voice talent, many of whom are squandered needlessly in support. We’re introduced to crafty mechanic and aspiring superhero Ratchet, working under the tutelage of Grimroth (John Goodman). 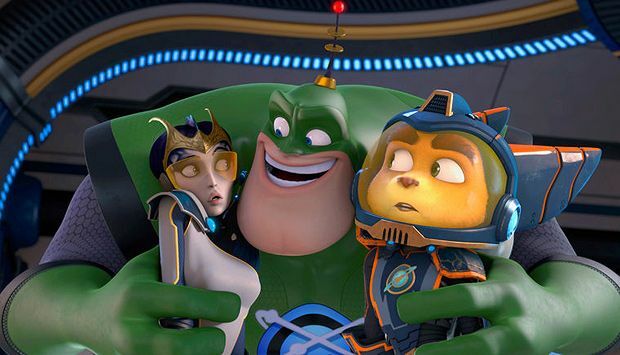 This little ‘Lombax’ is eager to prove his worth to the Galactic Rangers – led by oversized egomaniac Captain Qwark (Jim Ward) – who are looking to increase their numbers in order to protect the Solana galaxy from the wicked, planet-zapping Chairman Drek (Paul Giamatti) and mad scientist Dr Nefarious (Armin Shimerman). As the devious pair prepare a mechanical army commanded by Sylvester Stallone’s robot lieutenant, their machine churns out a defective ‘bot called Clank, who escapes and teams up with Ratchet and the Rangers. Though far from a gold-standard family film, this American / Canadian production from directors Kevin Munroe and Jericca Cleland has no shortage of energy, and if the animation can feel a touch lurid it’s impressive enough. Although it’ll primarily appeal to tweens and under, Ratchet & Clank doesn’t forget that many fans of this 14-year-old franchise will be all grown up; in recognition, it sports a certain self-referentiality that, as it swings between knowing nods and outright obnoxiousness, doesn’t always come off. Still, it strikes a neat balance between remaining faithful to its video game origins whilst finding its niche amidst comparable filmic fare (Guardians of the Galaxy, Big Hero 6, Despicable Me); in fact, it’s so in keeping with the cinematic climate that it seems more derivative than it is. And it fails to cultivate much pathos due to a slightly under-established dynamic between its leads and Ratchet’s thin back-story. The lack of scope for emotional engagement and unoriginal feel means it’ll likely be a distant memory by bedtime but, in the moment at least, this reasonably well-oiled enterprise has just enough spark. Crafty mechanic and aspiring superhero Ratchet teams up with robot Clank to join the Galactic Rangers in their struggle against devious planet-zapping types. PlayStation favourites transfer to the big screen with plenty of energy, if not much in the way of emotional engagement or originality.